So what we are really doing when we walk through the city is thinking, and thinking in such a way that our thoughts compose a journey, and this journey is no more or less than the steps we have taken, so that, in the end, we might safely say that we have been in a journey, and even if we do not leave our room, it has been journey, and we might safely say that we have been somewhere, even if we don’t know where it is. The work of Estela Saez has repeatedly turned to the intermingling, even reciprocity, between identity-construction and physical space (land-home-shelter) and its contingent shaping of memory and time. She focuses in her own migratory process -the departure of her Catalonian town, the making of a new home in Amsterdam, the endless commuting from country to country, the separations and re-encounters that the movement entails- to explore issues related to migration, mobility, roots, multitude and solitude and the emotional extremes that accompany such a nomadic existence. Former collections of the Spanish jewellery artist bearing titles such as Terra, Goodbye Nest and Recovered Connections, document her preoccupation with reconciling mobility and belonging and alternate conceptual and material references to earth and sky, tradition and modernity, permanence and ephemerality. 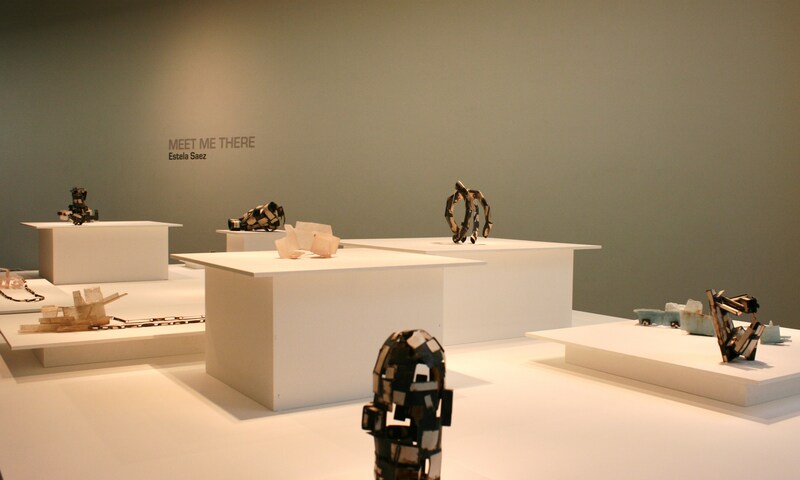 The emphasis placed on the creative and emotional process and the discovery made as a result in Saezs’ practice becomes more evident in the Meet me There series; a collection of objects and jewells that mark the artist’s first encounter with semi-precious stones and that narrate an oscillating journey between the sculptural and the wearable. Exhausted after years of continuous motion, the artist makes a stop to submerge in memories, awake the senses and re-think her own artistic search. Stationed in a new environment, she considers working with semi-precious stones by the first time. This is regarded by Saez as a new journey which takes place between the walls of her own studio. Her mind works at the same pace than her hands, which have got a hold on a fragment of a fleshy Australian jasper. She spends weeks slicing the hard stone intuitively, laboriously until it emerges as a thin as a sheet of paper. Saez has been enchanted by the possibilities of the stone, but needs a change that allows her to move more liberally. Large sheets of cardboard replace the tiny slates of stone and the artist takes the role of a construction worker. Miraculous scaffoldings, transitional refuges, invisible cities are the result of her building exercises, which become a metaphor for past times, the fleeting nature of life and the complexity of the artist’s state of mind at that time. But, faithful to her hand-bound scale and eager to continue working with stones, Saez envisions the final destination of this particular journey and asks the viewer to meet her there. Deviating from all conventional methods to fabricate jewellery, she cuts, files, binds both stone and metal and then constructs minute examples of impossible architecture. The result is a series of apparently antipodal objects that conjure images of makeshift shelters and glacial, deserted cities. Some are made of very thin segments of translucent rock crystal; fragile, frozen membranes that attempt to retain the memory of a familiar colour -the blue of the Mexican sky, the sand of the Catalonian coast, the pink of the skin and the milky gray of the smoke- and that gain volume through skillfully concealed junctures. In these pieces one can find ghosts and traces of processes, of the interaction between presence and gesture. Others objects have been constructed by overlapping dozens of silver patches to form a chaotically organized chiaroscuro; like the skeletons of an industrial disaster or a forgotten mechanical monster whose strength is now only a far memory. In a few pieces both materials reunite in a distanced interaction; as radically different species that have successfully negotiated an unlikely symbiosis. While the coarse silver structures appear as a resistant shell, the more vulnerable, almost ethereal stone formations suggest a vital core. By transforming and reaccommodating the material into metaphoric constructions of the process of contemporary mobility, Saez creates jewellery that go beyond their objecthood into a new aesthetical terrain. Trough quiet, elegant gestures, the artist knows the value of a perfectly calibrated decision, an intuitive constructivist impulse, softened by the small imperfections of the handmade, that foregrounds an ambivalent sense of strength and fragility. While Saez is not interested in drafting a specific narrative out of her accumulation of forms, she does think of the individual works as modular elements of a larger story-language, which reference a more universal sense of time, place and desire – ideas of home, roots, and security. She has referred to her work as ‘footnotes to a larger story’, allowing the central narrative to remain fluid, reshaped and configured by the viewer’s interaction with it. Holding one of Estela Saez translucent, sugar like, objects, causes to hold one’s breath – a perfect pause to wonder how these pieces will age.